Abbotsbury is one of Dorset’s prettiest villages and packed with character. It’s a pleasure to visit in its own right and you’ll enjoy wandering through the village checking out the offerings from the burgeoning art and craft community, whose shops and galleries are interspersed amongst the thatched cottages. The yellowy-brown stone dwellings and the old-fashioned raised pavement run the length of the village and, when combined with the beautiful setting, the overall feel is one of “chocolate box” scenery without losing the sense of this being a real, living village. 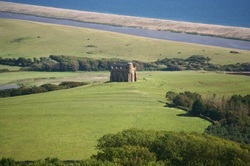 Abbotsbury is overlooked to the north by rolling hills and to the south by St Catherine’s Chapel. This atmospheric and enchanting shell of a building is worth the walk for three reasons: the view it affords of the Fleet, the Chesil and the sea; the view it gives you back over Abbotsbury; and, last but not least, the chance to read St Catherine’s Prayer - which could have been written by a much more concise forerunner of Bridget Jones! So ladies, if you’re a 30 something singleton looking for your Mark Darcy (or even a Daniel Cleaver), get yourself up that hill and start praying! Whether or not you take your big pants is entirely up to you! As for paid for things to do in Abbotsbury, on the outer fringes of the village, there are three first-rate attractions, with something to appeal to all ages. For the youngsters in your group there’s plenty of fun to be had at the Abbotsbury Childrens’ Farm. 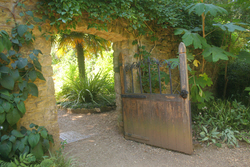 For those who like to take life at a more sedate pace, the Abbotsbury Sub-tropical gardens are a beautiful horticultural and arboreal diversion. 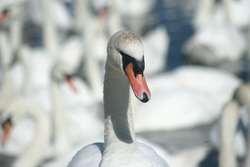 Lastly, but by no means least, there is the Swannery for which Abbotsbury is most famous. The overall feel is one of “chocolate box” scenery without losing the sense of this being a real, living village"
Picturesque village and much, much more!